I tend to be wary of bands from the 80s/90s attempting a comeback, especially if their sound hasn’t really changed much since then. Nobody likes regressive, played out music. So where do we stand with MADAM X? The glam rock band was originally formed by sisters Maxine and Roxy Petrucci (no relation to God aka John Petrucci), and they released one album back in 1984. Now they’re back in 2017 with a second full length effort by the name of “Monstrocity” that is classic hard/power rock, and it’s a pleasant surprise, for the most part. Unfortunately, the album still is stuck in a pretty textbook late 80s/early 90s sound. It’s considerably hard to release music that is 25 years behind the curve and gain much traction. That task is hard enough in today’s music industry even for bands that used to have substantial followings, so for a band that only has one album to its name released 34 years ago, “Monstrocity” faces an uphill climb. Fortunately for MADAM X, the talent is all there. What ultimately saves this album from being an antiquated wash is the high level of musicianship and crisp production value. The songwriting, while objectively well done, may be stuck in the 90s. The performances however, are not. Classic fans of rock and roll that have yet to grow tired of the genres roots will be psyched (and MADAM X was born right in the thick of it in Detroit). The talent level is very very high, and it almost makes it a shame the album stands virtually no chance in the marketable mainstream. Maybe that wasn’t the band’s intention, so supposing all they were seeking to do was create a skill show filled album for their own pleasure, they succeeded in that regard. The level of talent is obvious from the beginning. A classic rock and roll guitar solo with the chambered 80s production we love oh so much leads things in, which flawless execution I will add. I was prepared to be critical of the album from the get go solely based on the outlandish and dated cover art, but you can’t argue against the talent presented here. Follow that solo up with a wailing, belted, high pitched scream from vocalist Bret Kaiser that is delivered flawlessly and then a chugging and grooving rhythm guitar riff, and the album is on it’s way. The chorus is as catchy as the intro, the verses flow together well, it’s a fantastic song and the perfect way to start off the album. Track two and title track “Monstrocity” opens with powerful and epic drums, it’s borderline proggy and it’s definitely unique! The sign of mature songwriting is the ability to elevate and take sounds to a new place. This is a power track, it’s fast and it serves as a perfect summation of the sound the album is hoping to achieve. More fantastic guitar work highlight the number. Track four “Freak Parade” is a classic middle-of-the-album song intended to spice things up and provide a shoe stopping effect, and it succeeds in that right. One of the most catchy choruses on the album, the lead and rhythm guitar work together as well as anywhere else on the album. We also get some female vocals, which is a lot of fun. Track nine “The Rise” has a much heavier and more modern/bassy groove to it, which I love. It still doesn’t break out of the 80s style, but it takes it to a very listenable place. The verses are a little mucky, the vocals and the guitar struggle to stay on the same page, but it is seriously catchy rhythm guitar work on its own. The drums are a bit simplistic for my taste, in a slowed down groove and chunk number like this you tend to look for more speed and cymbal infused drums to move things along, but we don’t get that and it drags a bit. But, despite the flaws it’s really cool to see Madam X going a less obvious direction with this track. All in all, while this album does turn me off at its core due to the derivative and played out style, I cannot say it’s a bad album as MADAM X manages to rise above any overplayed muck through sheer skill, quality production, and cleverness in writing. 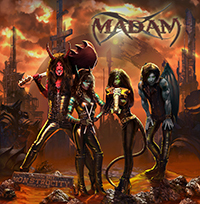 If you aren’t yet tired of the classic rock and roll that gave birth to the modern metal genre, this album is going to be a lot of fun and worth your time! It’s a powerhouse of 80s glam rock at its 2017 finest.